Within the last few days, RSJuno! has undergone some changes through 2 new revisions, v1.0.6 and v1.0.7. The new RSSeo! revision comes with two important integrations: Google Analytics tracking and reports. If you're enabling the tracking feature, RSSeo! will automatically include the Google Analytics tracking code into your site source. Just add the login details, along with the web property ID and RSSeo! will do the rest. Posted by Mihaela	in RSSeo! RSForm!Pro - Google Analytics Plugin for tracking forms in Joomla! 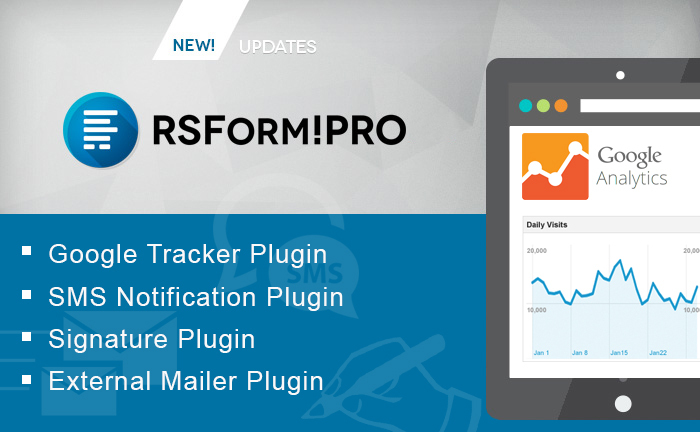 RSForm!Pro has a new plugin for Joomla! that it's easy to implement and will help you track forms in your Google Analytics (GA) reports. In order to view how many visitors accessed a form in Google Analytics and how many of them has actually completed the data and submitted the form, you have to place some additional tracking code to your website pages and configure goals. Usually goals are used on key pages to analyze the actions of a visitor in a set of related pages, such as shopping cart or order form.In our case the goal would be the steps that makes a visitor to reach the "Thank you" page of the form.